Abstract—In Nigeria, the fisheries sub-sector has been dominated by small-scale artisanal fishers who live in communities that are characterized by high levels of poverty and food insecurity aggravated by overexploitation and depletion of the fishery resources, and other environmental problems. Kainji Lake has suffered reduced inflow levels from 393,369m/cu3 in 1994 to 307,231m/cu3 in 2011. Similarly, the fish yield dropped from 27,501metric tons in 1994 to 3,476 metric tons in 2011, which jeopardized the livelihoods of hundreds of thousands of stakeholders. The objective of this work was to develop an adaptive strategy model using the concept of sustainable livelihoods approach. Data were largely obtained through a field survey (using questionnaire) in 30 fishing communities, and supplemented by data from other authorities. The results showed that a combination of four livelihood activities is the optimum. The implications of the work are discussed. Index Terms—Environment, fishermen resilience, Kainji Lake, livelihood strategy, resource sustainability. A. A. Tafida is with Agricultural Economics and Extension Department, Modibbo Adama University of Technology, PMB 2076 Yola, Nigeria (e-mail: tafjam2003@yahoo.com). M. Galtima is with Geography Department, Modibbo Adama University of Technology, PMB 2076 Yola, Nigeria. Cite: A. 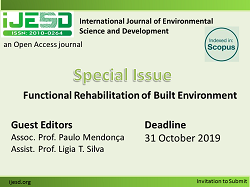 A. Tafida and M. Galtima, "Environmentally Induced Alternative Livelihood Strategies among the Artisanal Fishers of the Kainji Lake Basin, Nigeria," International Journal of Environmental Science and Development vol. 7, no. 1, pp. 36-40, 2016.